Ergonomic engineering with zenon also means that complex functionalities are available "out of the box". Without programming, just by setting parameters, you can create complex applications per mouse click. The central, object-oriented approach in zenon and the diverse possibilities to automate tasks, make you even quicker in project generation. 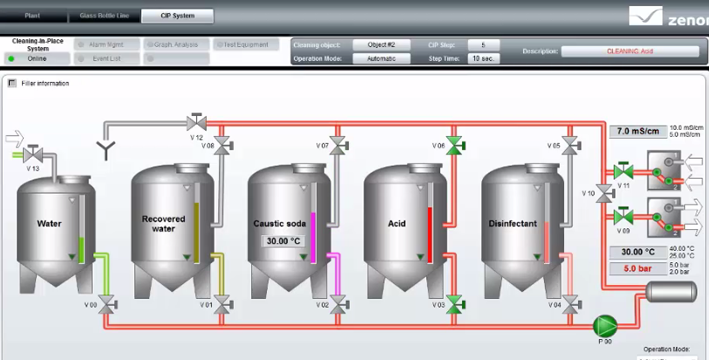 zenon supports quick, intuitive and efficient engineering. At the core is the principle, "set parameters instead of programming". That means - complex demands can also be configured easily per mouse click - without having to write a line of code. All zenon network functions are parameterized by mouse click. Thus, even complex infrastructures can be quickly created and stabile operations are guaranteed. Many properties and attributes can be defined in zenon at a central point and are then available everywhere in the project. For example fonts, frames, data type, limits and much more. Freely changeable assistants to support for repeated tasks and for the creation of new projects. Object-orientation, global projects and sophisticated import and export interfaces allow the efficient re-use of individual elements and complete projects. Projects and parts of projects can be easily and safely distributed via the XML interface. When exporting screens as XML files, all variables, drivers, elements, templates etc. are also exported. This data can be selectively or fully imported into another project.